National Institute for Health and Care Excellence (NICE) clinical guideline 95 (CG95) was introduced to rapid-access chest pain clinics (RACPC) to aid investigation of possible stable angina based on pretest probability of coronary artery disease (CAD). Following a six-month audit of its implementation we introduced a modified version: patients with low/moderate risk of CAD were referred for computed tomography coronary angiography (CTCA), while those at high/very high risk were referred for invasive angiography. Patient records of 546 patients referred to our RACPC over a six-month period were retrospectively analysed. Pretest probability of CAD, referral for initial investigation, and outcomes at a minimum follow-up time of six months were documented. Incidence of CAD correlated well with pretest probability. Moderate-risk patients had a low incidence of CAD and revascularisation. High/very high-risk patients had a high incidence of revascularisation, and this was predominantly for prognostically significant disease. In conclusion, low rates of CAD in low- and moderate-risk groups justifies the use of CTCA as a first-line investigation in these patients. Routine investigation of very high-risk patients allows a high proportion to undergo revascularisation for prognostically significant disease. Strict adherence to NICE CG95 could lead to these patients being missed. 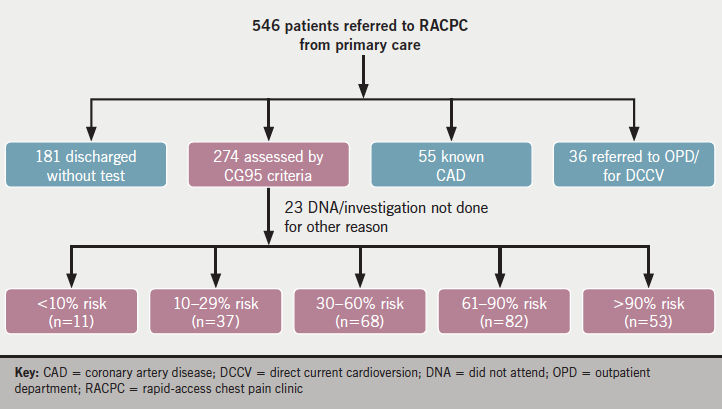 Our institution has previously audited the implementation of NICE CG95 in our rapid-access chest pain clinic (RACPC).4 This demonstrated that patients in the moderate-risk group (30–60%) had a low incidence of CAD, and those in the high-risk (61–90%) or very high-risk (>90%) groups had a high incidence of prognostically significant disease with subsequent high rates of revascularisation. As a result of this, we adjusted our local guidelines in a modification of the NICE CG95 protocol, such that patients with a high or very high risk of CAD (>60%) were referred for invasive coronary angiography, and those with low or moderate risk (≤60%) were referred for CTCA. A retrospective review was carried out of 546 consecutive electronic case records of patients referred to our RACPC from primary care and clinically assessed during the six-month period from 1 January 2014 to 30 June 2014. Patients were assessed by senior specialist nurses according to the locally modified version of NICE CG95 and, where indicated, referred for further testing. Time from date of referral to being seen in clinic was documented, as well as initial pretest probability of significant CAD and investigations requested. Time to initial investigation was also recorded. The incidence of significant CAD (defined by the guideline as ≥70% diameter stenosis of at least one major epicardial artery segment or ≥50% diameter stenosis in the left main coronary artery at invasive coronary angiography1) and of revascularisation by percutaneous coronary intervention (PCI) or coronary artery bypass surgery (CABG) was assessed at a minimum of six months following the end of the study period. Of the 546 patients referred, 299 were male and 247 female, with a mean age of 62 ± 0.6 years (median 62 years). The mean and median time from date of referral to date seen was 12 days (data not available for four patients). One hundred and eighty-one patients (33%) were discharged from the RACPC without a test (figure 1). The large majority of these were assessed as having either no chest pain or chest pain that was clearly non-anginal in origin. A small number (five patients) had probable angina but further investigation was deemed inappropriate or declined by the patient, and so they were managed medically. The proportion directly discharged was higher than that in the original audit (25%).4 Thirty-six patients (7%) were referred directly to the cardiology outpatients department (OPD). These patients were judged to be suffering from problems other than angina, such as arrhythmia or heart failure. Fifty-five patients assessed (10%) had known CAD and were excluded from the study. 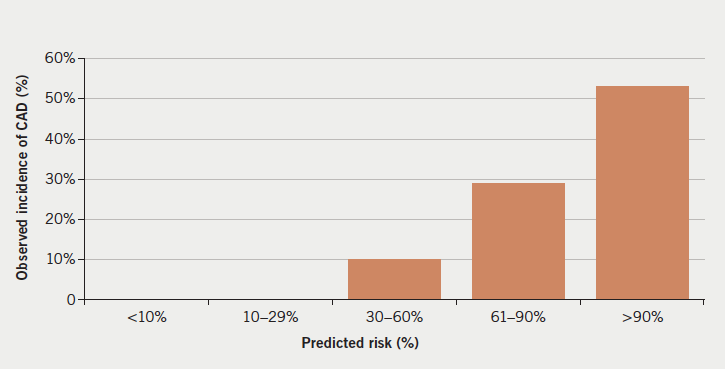 Twenty-four patients in the high-risk group (61–90%) had significant CAD (29% of the group) (figure 2a). Ten patients (12%) underwent revascularisation, of which, eight (10%) were for prognostically significant disease (figure 2b). Twenty-eight patients in the very high-risk (>90%) group had significant CAD (53% of the group) (figure 2a), plus one uncertain (positive exercise tolerance test [ETT] but no further testing). Twenty-one of these (40% of group) underwent revascularisation and one was referred for CABG, but died before surgery. 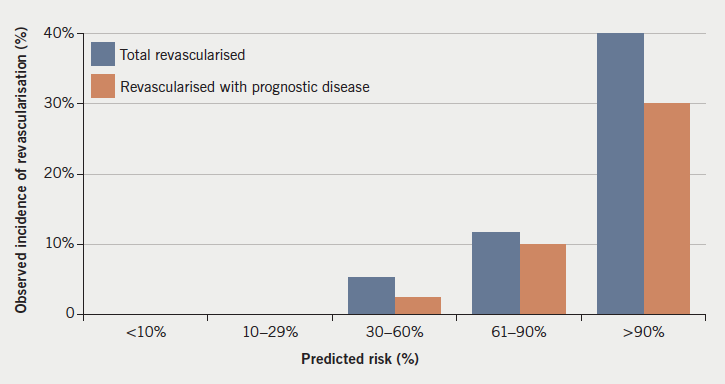 Sixteen of those revascularised (30% of group) had prognostically significant disease (figure 2b). Over all risk groups, four patients who had a positive CTCA went on to have functional testing, of which, three tests were negative (two stress echoes [SEs], one myocardial perfusion scan [MPS]). One SE was positive, but this was possibly due to left bundle branch block, and, as symptoms settled, no further investigation was carried out. One is awaiting a SE. Three patients with significant CAD at angiography went on to have functional testing, of which two were negative (one SE, one MPS). One MPS was positive and the patient went on to have PCI. The mean time taken from being seen in the RACPC to having a CTCA was 32 days (median 30 days, data not available for one patient). For SE it was 96 days (median 84 days). Only 17 (21%) of the high-risk group and five (9%) of the very high-risk group were referred for tests other than invasive coronary angiography. Only four ETTs were carried out across all groups. Ten patients (12% of total done) had CTCA suggestive of significant CAD and were referred for further investigation that was subsequently negative. Seven underwent diagnostic invasive coronary angiography, two had a SE and one a MPS. In addition, one patient is awaiting a SE. However, it should be noted that two of these scans only had calcium scoring carried out, rather than full angiography, due to technical difficulties. However, four positive scans (40% of false-positives) did have moderate CAD at invasive angiography, which did not reach criteria for significance, but would, nevertheless, have benefited from secondary prevention. For comparison, the patient who had a positive SE was found to have significant coronary disease at invasive angiography. Overall, incidence of CAD correlated well with pretest predicated risk. However, the moderate-risk group (30–60%) had a low overall incidence (10%), which correlated well with the original audit (15%).4 This continues to lend support to our strategy to use CTCA as the first-line investigation in this group, freeing up more resource-intensive functional imaging for patients with known CAD. Indeed, this approach is in line with current ESC guidelines.3 The difference in time to investigation between CTCA and SE supports the hope that this will further improve waiting times. A number of patients in the moderate-risk group continued to be referred for SE as a first-line investigation, reflecting continued deviation from the protocol. This could be due to issues implementing a guideline in real-world practice, and may also reflect residual adherence to the original CG95 protocol, and so a need for further assessor education in the RACPC. In addition, some patients may be unsuitable for referral for CTCA, for example those with a large body habitus or unable to have beta blockade to ensure optimal imaging during CTCA. This continued use of SE in the moderate-risk group may partly account for the continued high waiting time for a SE found in this re-audit. However, it should also be noted that a large number of SEs were carried out in the known CAD group, which was excluded from the study (16 patients, 29% of patients with known CAD). The high waiting time may, therefore, also reflect the use of SE to assess known CAD in this cohort, and as fewer requests are made by the RACPC, this labour-intensive resource will be more available for this use. Although CTCA had a false-positive rate of 12%, care should be taken in interpreting this. Although these patients did not have significant CAD at invasive angiography, as defined by NICE CG95, 40% did still have moderate CAD. This could be seen as a further advantage of CTCA over functional imaging, as detection of moderate CAD in these patients would allow aggressive risk factor modification to limit disease progression. In addition, the reliability of a negative CTCA in ruling out significant CAD, which has previously been demonstrated,2,5 should not be overlooked. We have continued to show a high incidence of revascularisation in the very high-risk (>90%) group, predominantly for prognostically significant disease (30% of all patients in the group). This was larger than the rate of 10% found previously.4 This, therefore, continues to demonstrate that implementation of the NICE recommendations to treat this group medically, and not refer routinely for angiography, would likely lead to a significant number not undergoing prognostically beneficial revascularisation. This supports our decision to treat patients in this group in the same manner as high-risk (61–90%) patients, and carry out invasive coronary angiography. Following our recently published study of the implementation of NICE CG95 in our RACPC, we introduced a locally modified version of this protocol, such that all low- and moderate-risk (≤60%) patients were referred for CTCA, while all high- or very high-risk (>60%) patients were referred for invasive angiography. Although significant deviation from the protocol was still found in some areas, there was a continued low incidence of CAD in low- and moderate-risk patients. In addition, a high incidence of revascularisation for prognostically significant disease in very high-risk (>90%) patients lends support to our approach to carry out angiography routinely in this group. We shall, therefore, continue to implement our modified version of NICE CG95 in our RACPC. The authors would like to acknowledge the contributions of Harriet McCullough, Terri Thompson and Deborah Price. Use of a modified version of National Institute for Health and Care Excellence clinical guideline 95 (NICE CG95) should be considered given the above findings.